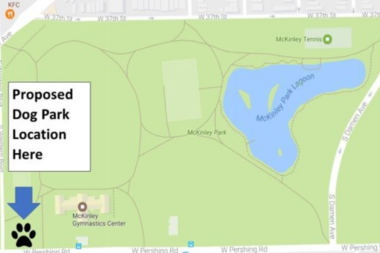 CHICAGO — Volunteer dog owners and dog lovers have won approval from the Chicago Park District for a proposed dog park in McKinley Park, according to a news release. The McKinley Park "Dog Friendly Area" Committee is seeking to raise $10,000 to help fund the dog park, which would be just southwest of the McKinley Park Field House. The fundraising effort began Friday. The group is also raising funds at the McKinley Park Farmers' Market this summer and will be working on planning additional fundraising events. The committee meets at 7 p.m. the first Monday of each month at the field house, and its next meeting is May 1.